For nearly 10 years or so, there was a document filed in every bankruptcy case known as an electronic filing declaration. This declaration was signed by the debtor and it basically said that the case was being filed electronically and that the signature on such document was the equivalent of a signature on all the documents. This assured the court that the debtor had met with the bankruptcy attorney and had signed the document. Without the original signature, the bankruptcy court could not be assured that the debtor ever saw the petition that was filed on his or her behalf. This system was working well. Skipping forward a few years, the bankruptcy clerk’s office and the bankruptcy judges in the northern district of Illinois decided that if the schedule was amended, then there should be an amended electronic case filing declaration stating that the debtor had read the amendment and approved it. Well, this got to be a pointless exercise in that many debtors signed amended declarations in advance of reviewing the actual amendment. Thus, enter the latest debacle in irrational thinking by the court and the clerk. The new requirement in Chicago for bankruptcy clients is that they sign original signature pages everywhere it is required within the bankruptcy petition. Gone are the days of the original electronic case filing declaration which stated that the debtor had reviewed the petition and that the signature on the one-page constituted approval for the petition. Gone are the days of the amended electronic case filing declaration which stated that the signature on the declaration was approval for the document that was filed and the amendment that was filed. Now, in the courts and clerk’s wisdom, the debtor or debtors must sign every single signature page as if it were the original. 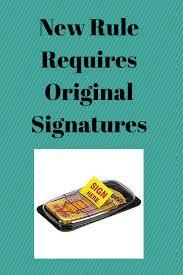 These signature pages then need to be filed with the clerk’s office electronically. What we are truly left with as a result of this rule change is a greater likelihood that most debtors will never see or review their bankruptcy petitions. Since all the signature pages can be printed out separately, there is no guarantee that the debtors are actually reviewing the petitions filed on their behalf by bankruptcy attorneys. So in essence, the court and the clerk are trying to mandate something that simply cannot be mandated. Bankruptcy clients are either going to review the petition or they are not. They are still however, going to sign the signature pages upon the advice of their counsel; which leads me to the next point. Bankruptcy attorneys should be given more credit by the bankruptcy court and the bankruptcy clerk. The court has done well in rooting out fraudulent and ineffective bankruptcy attorneys in the past. They have gone after attorneys that have overcharged, violated court orders and showed no remorse for their actions. I believe that once a bankruptcy petition is filed and an electronic declaration is obtained, there should be more credit given to that particular attorney that the job was done correctly. After all, at the 341 meeting of creditors, the trustee will ask the debtor if they reviewed the petition and signed it. The trustee will ask if all the information is true and correct to the best of the debtor’s ability. The trustee will ask if the debtor would like to make any amendments or corrections to the schedules. These questions are all given and answered under oath with the attorney present. Why the judges and the clerk all of a sudden believe that debtors were not reading, reviewing, and signing their petitions is beyond comprehension. The good attorneys and the good law firms are going to continue to have their clients review the petition in addition to having them sign all of the signature pages as required by the new rule. Not much has been accomplished other than changing the rules for the sake of change. Change for the sake of change with no benefit can never be a good thing.